I share your sentiments and passion for helping people slow down. After having worked extensively with super busy parents and professionals at every level of the corporation, I have helped thousands to focus, focus, focus! Too many people wear busyness as a badge of honor on their sleeve rather than mindfully living their life based on their priorities and values. I encourage my audiences and coaching clients to do something different or do something differently if they want different results. A hectic, joyless lifestyle isn’t what any of us strives for, is it?? Hi Christine – I’m so glad I stumbled upon your blog (through Peter Shankman’s HARO) and can’t wait to read your book. I tend to be one of those speed-a-holics, just trying to get everything done (I LOVE seeing those checks on my to-do list when something gets done!) I’m starting to learn the beauty of slowing down and stopping to smell the flowers now that I have a child, but I know that I have so far to go! I like your approach. My own writing is also about finding balance. Simplicity is a big theme in Quakerism (my religion), but I find material simplicity much easier to attain than schedule simplicity in a family of four. Can’t wait to get your book. My trick is to dive into the woods and take a very deep breath. Works about 90 percent of the time. I am truly looking forward to having you share your time challenges and insights when it comes to slowing down. I find people say they want to slow down, but aren’t willing to do what it takes to actually make it happen. Everyone seems too afraid that they’ll “fall behind”. I can hardly wait to speak with you on “Loving the Life You’re In”. See, even our words make us go too fast. (but if I slow down and enjoy all the time till the show airs, I’ll be able to wait with patience and grace…) I remind everyone (myself included) to Stop! Breathe! & Focus! It’s the fine art of responding instead of reacting. I wish you all the best! Thank you for your delicious eloquence, Loren. I truly look forward to connecting with you and your listeners soon! 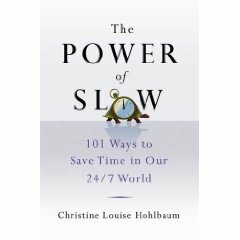 Just discovered your blog and book TODAY after writing this post yesterday about being greedy for time: http://bit.ly/1bKB9V, thus so timely. As a former life coach, I’m aware of all of the usual advice for slowing down and becoming mindful, but I find your book filled with specific, concrete ideas that are fresh and useful—YAY! I previewed it on Amazon (thank you for doing the Look Inside), ordered it right away, tweeted about it (@obrown), and cannot wait to get it. Needless to say, I’ll continue to write about what I learn as I read it. Thank you for sharing what you’ve learned along your journey; I know it will help me greatly! Having only recently taken major steps to becoming a minimalist in virtually ever facet of my life, I have come to realized that to be most effect and the least burned out, I decided to pursue only two things in my life: contract bridge and voice acting. And that’s it. Two days ago it occurred to me that it did not matter how much I completed in the run of a day. As long as I completed 1 or 2 tasks per day in the direction of my goal, I would get there without being totally exhausted. I don’t have to stay up all night or work 24/7 … just slow and yes …. steady … and yes … consistently. For me that is the key to success. P. S. I discovered your website on page 9 of the Smith Alunae Quarterly. What a wonderful way of looking at things! Instead of getting mucked up in a million little tasks, focus on the one or two big things that lead toward your goal. That is exactly what the power of slow encourages people to do. Zen-like plodding is what I call it. Never lose the Big Picture. It is the canvas with which we were born. Wonderful stuff! Thansk for stopping by, Vita! Wow – what a neat concept! Just the title of your book alone is transformational. I look forward to reading more on your blog. Life is in the details. Good Line. Yes. Dear Christine. I really enjoy reading your blog – your posts are always interesting, original and inspiring. That is why I would like to give you the Inspiring Blog Award! That is so incredibly lovely. Thank you ever so much. I am humbled by your praise! !